Occasionally an app comes along that serves a very useful and simple purpose. My Movies is one such app and for what it does, it does it very well. My Movies is a management app that allows you to scan and catalog your entire movie collection from an online database of over 600,000 DVD, Blu-ray and HD DVD titles. It is available for both Android and iOS devices. Over the years I have accumulated an *impressive collection of movies – the titles of which I lost track of a long time ago – usually resulting in my having to riffle through boxes, stands and DVD cabinets to remember exactly what the hell I already own. Thanks to this handy little gem, my entire collection is available for perusal at a moment’s notice from the palm of my hand and is synced across all of my devices (requires creation of a free user account). My Movies is easy to use: simply use your phone to scan the barcode found on the packaging of each of your movies and Voila! 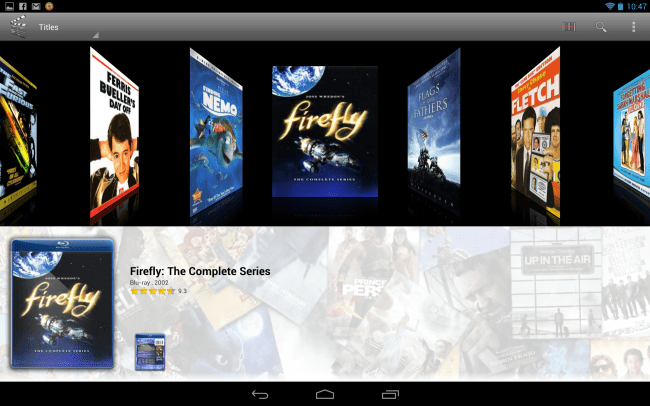 The app will search the movie’s unique UPC code against their database – including special collections, Blu-ray, standard definition or widescreen versions – and organize it alphabetically for you. The scanning feature (built into the app) is my favorite. It makes it as simple as using your smartphone’s camera to read the barcode… the app does the rest of the work for you. Should the unlikely scenario arise in which the app is unable to identify the title through the UPC code (this happened to me about 5 times during the course of adding over 100 movies), you have the option to manually enter the title and select from the search results. Once you have created a free account and added your collection, My Movies will sync your entire library to their servers, thereby allowing you to sync your movies across all of your supported devices by simply signing in to the app. Beyond that, you have the ability to share your entire movie collection with friends and family for them to choose from, view trailers and link to the each movie’s specific IMDB page within the app. My Movies also supports tablets, Windows Home Server, Windows Media Center and Mac OS X. ‘My Movies’ offers multiple viewing options to make finding titles or re-discovering your movie collection an enjoyable experience. – Add by barcode search, title search, manual entry or camera scan. – Add to titles to different groups (Owned, Wished and more). – Personalize with location, tags, notes, rating and more. – Browse with shelf, list or CoverFlow views. 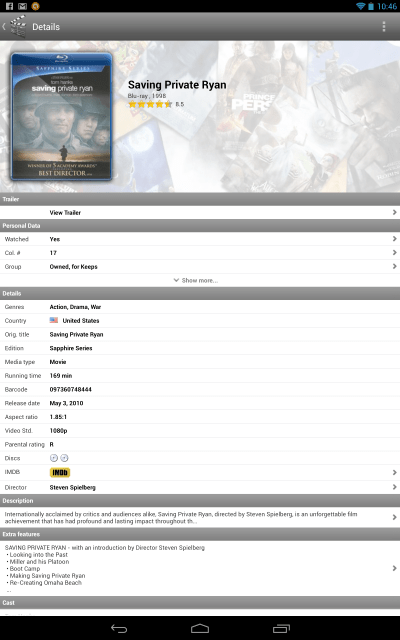 – Detail view with synopsis, full cast list, audio tracks and subtitles. – High quality front and back covers. – Multiple sort and search options. 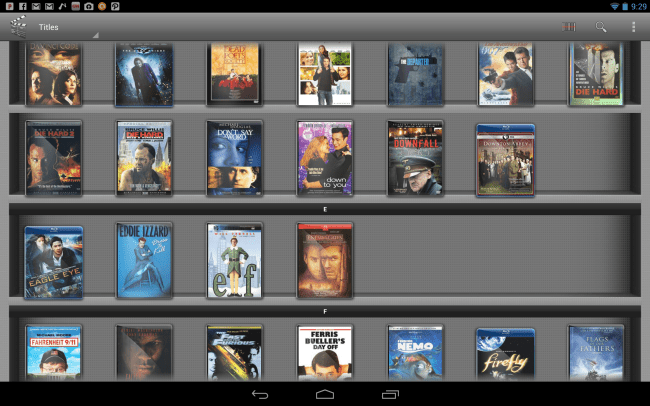 – Shake to randomly select a movie from your collection. – E-mail movie list as TXT or CSV. – Loan titles to friends and keep track. – Online title collection to share with family and friends (http://c.mymovies.dk/demonstration). – Photos, biographies and ‘starring in’ lists. – Releases section with upcoming DVD and Blu-ray’s. – Use same collection on multiple devices with automatic online sync. – Automatic profile update for latest and most accurate data. – Remote control for Windows Media Center and Dune players. You can try My Movies free of charge, but the free version is limited to the ability to only add 50 titles and is really just intended as a way for you to ‘test drive’ the app before upgrading to the Pro version. I upgraded to the Pro version (Android $5.99, iOS $4.99) almost immediately and feel confident in recommending this app to anyone who has a big movie collection and has always wanted a clean and efficient way to organize, view and access it. Although the price tag for the Pro version may seem steep for some, I can assure you that it is worth the cost and I cannot express how great it is to have my entire movie collection available at a moment’s notice to share and peruse on my tablet or smartphone! Previous articlePodcast 412: Stimulated Boredom Moves to DC!